Liquorice (Mulethi/Yashtimadhu) is the root of glycyrrhiza glabra from which a sweet flavour can be extracted. Mulethi is a herb from the legume family and dried sticks of liquorice root widely used as a flavoring agent in sweets, toothpaste and beverages like soft drinks and beer. It is good source of vitamins and minerals. 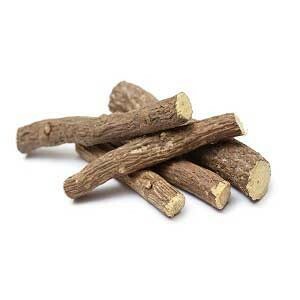 Buy mulethi root sticks online at best price from KiranaPlace, a online herb store in India. Liquorice, commonly known as mulethi/yashtimadhu in India. It is a herb from the legume family. Dried sticks of liquorice(mulethi) characteristic sweet taste (50 times more sweet than sugar) flavor. Mulethi is one of the most widely consumed herbs used for medicinal benefits across the world. It has been in use since ancient times in Indian Ayurveda as well as in Chinese medicine. It is good source of B vitamins and vitamin E. Liquorice roots sticks(yashtimadhu) also contains minerals like phosphorous, calcium, choline, iron, magnesium, potassium, selenium, silicon and zinc. Mulethi helps in protecting against virus, bacteria and fungi due to the presence of Glycyrrhizin. Mulethi antioxidant property helps treat liver disorders, such as jaundice, hepatitis and non-alcoholic fatty liver disease. Mulethi root sticks is helpful in treating digestive problems. Mulethi can treat respiratory tract infections, such as a sore throat, cold, cough and asthma. Mulethi helps to reduce excessive fat accumulation in the body. Mulethi supports oral problems such as cavity-causing bacteria, plaque, bad breath, gums.